There’s been a lot of focus on my current NTNP (Not Trying Not Preventing) situation here on the HFM blog. And on my ‘About’ page, I claimed that this was to also be a foodie blog. However, out of the previous 18 posts, only four of them center on food. If we were making a pie chart (and why the hell shouldn’t we? 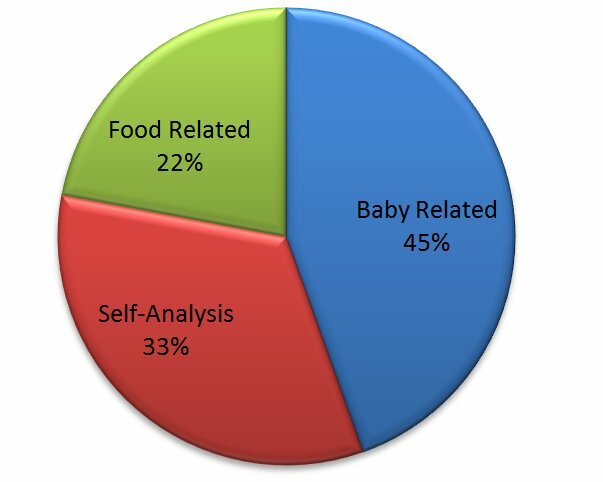 ), only 22% of this blog is dedicated to food. And well, when you’re running at less than half, you can’t really call it a foodie/TTC blog, now can you? Disturbingly, this chart also reveals my preoccupation with myself. But hey, I suppose a blog is also pretty much a diary/journal. So there, I’ve justified spending 33% of the posts on myself. Anyway, back on track. 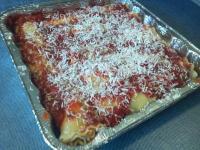 I’d like to share a recipe for manicotti with you. It’s a bit labor intensive, what with actually stuffing the tubes of pasta, but worth it. My friend described it as having been stuffed with magic. This is not the case, (because you have to pay for my magical version) but sometimes simple ingredients make magically delicious things. Before you cook the manicotti noodles, consider your bakeware. I used a 9×9 casserole, but no matter what size you use, stack the uncooked manicotti into the cooking vessel to figure out how many tubes you need. Then assume you can add one or two more to the vessel once the tubes are cooked and pliable. And also assume that two or three of the noodles will fall apart during stuffing and may end up unusable. So for good measure, boil up four to five extra noodles than will fit into your casserole dish. Now, put that many noodles into a large pot of boiling water to which salt as been added. No need to cook the noodles until they are completely soft since they will be cooked again in the oven- the al forno method. Just get them to a point before al dente. Soft enough to squish into the casserole but stiff enough to hold up to the stuffing treatment. It might take a couple of tries. But to help in your pursuit, pull the noodles before you think they are ready. Drain them and immediately rinse with cold water. This will stop the cooking and also cool them down enough to handle. Once this is done, set the noodles aside but work quickly with the filling because you don’t want the noodles to start to dry and stick to each other. A tiny bit of oil on the freshly rinsed noodles might help stop sticking, but work quickly anyway. While the noodles are cooking, break up and brown the sausage in a skillet over medium heat. When all of the pink has cooked away, remove it from heat, drain off excess fat and set aside. Once your spinach is thawed, put it all in a tea towel, roll it up and then wring it out. Frozen spinach has a lot of extra moisture and any lasagna-like concoction should have as much of the water as possible removed. In a mixing bowl, add the sausage, spinach, ricotta, grated Parmesan, the egg and a pinch of salt. The marinara and sausage will have salt a plenty so no reason to add too much salt now. You will also need to put in about 3/4 of the pound of mozzarella cheese into this mix but reserve 1/4 pound (or one healthy handful) to sprinkle on top once the tubes are stuffed. With the mix finished you are ready to stuff your manicotti. I use a small spoon to do this, but if you can work quickly enough and feel fancy (or if you’ve prepared your filling in advance of boiling your noodles) you can put the filling in a pipping bag normally used for frosting cakes. This will make filling the noodles much quicker, but I find the bag harder to work with. Open your jar of marinara and spoon it over the manicotti in a nice layer. You want it to cover your noodles as completely as possible. Tap your casserole on the counter to remove air bubbles as the sauce slides down into the cracks between the noodles. Add more sauce as necessary I used an entire jar, but you may not. Now sprinkle on the mozzarella that you reserved earlier. It should start looking like a real Italian classic at this point. Pop that baby into your pre-heated 350 degree oven for about 20 minutes. Everything is pretty much cooked already, but you’re going to bring the sauce to a slight bubble and melt that cheese. If you try this recipe, let me know if you liked it. What did you change or do differently? I wanna hear from you! I think I’m going to put this on next week’s menu! Thanks for the recipe. Oh good. Let me know if you did anything differently. I am looking for innovation! I’m definitely going to try this one! And food, too. You just get better and better, woman. This is my first attempt at manicotti and I am in no way a foodie. I had half a box of manicotti noodles, half a pound of sage sausage and only cheddar and parmesan cheese. So by no means will I say I followed your recipe and unlocked the same magic you spoke of. But It was still determined delicious by family and I will make again. I equal parted the sage sausage with pork sausage. Threw in some ground sage while browning. Then, I halved your recommended portion of mozz for cheddar and added it in. I knew I wouldn’t be able to use all the mix so once the pasta was in the oven, I cooked it up(raw egg) then served it with crackers and diced tomatoes for the fam to snack on before dinner. My mother cooked up a batch and left the box encouraging me to at leas try it. Thanks for your page It was a hit! That’s great news! I think this is the first time I got a reply on a recipe. The best part about cooking is making great food with what you have on hand. Thanks so much for the feedback!